Gun rights advocates announced on Monday night that they expanded their suit over whether gun schematics can be published on the internet to include representatives from new states. The Second Amendment Foundation, in cooperation with 3D-printed gun pioneer Cody Wilson's company Defense Distributed, added New York governor Andrew Cuomo, Pennsylvania governor Thomas Wolf, Delaware attorney general Matthew Denn, and Pennsylvania attorney general Josh Shapiro to their suit. They accuse the defendants of "unconstitutional prior restraint" for their efforts to block the publishing of gun files, including those with instructions for printing gun components on 3D-printers, despite the State Department settling with the plaintiffs to allow their publication earlier this summer. "Under the color of state law, the Defendants are denying us our civil and constitutional rights by waging a coordinated and politically fueled campaign to censor Defense Distributed," Alan Gottlieb, executive vice president of the Second Amendment Foundation, said in a statement. "What these public officials are attempting is an unconstitutional exercise of prior restraint. They are trying to prevent Defense Distributed and its founder, Cody Wilson, from exercising free speech." The suit accuses the government officials of abridging Wilson's First Amendment rights, Second Amendment rights, due process rights, and equal protection rights as well as violating the Commerce Clause and attempting to supersede federal laws. Their brief said government officials are specifically targeting Wilson's company because they don't like his message. "Under the color of state law, the Defendants are waging a coordinated and politically fueled campaign to censor Defense Distributed—and only Defense Distributed," the brief said. "They do so despite the fact that federal law expressly authorized Defense Distributed to publish the files at issue on the internet; and they do so despite the fact that countless other members of the public freely engage in the same or similar speech. The Defendants censor Defense Distributed because they dislike speech favoring the Second Amendment and because they dislike this particular speaker." After Wilson developed and published his Liberator design in 2013, its design files have been widely shared across the internet. In the wake of a federal judge ordering the State Department to set aside its settlement with Wilson at the request of many of the defendants in this new suit, a coalition of gun-rights groups have republished the Liberator file and a collection of additional gun files Wilson had planned to publish. Their site, CodeIsFreeSpeech.com, has faced efforts from major tech companies like Facebook and Amazon to censor its existence from their platforms but has not faced any legal action from state or federal authorities. The Second Amendment Foundation said it intends to protect its members' free speech rights by winning the suit. "This has turned into a classic First Amendment case," Gottlieb said. 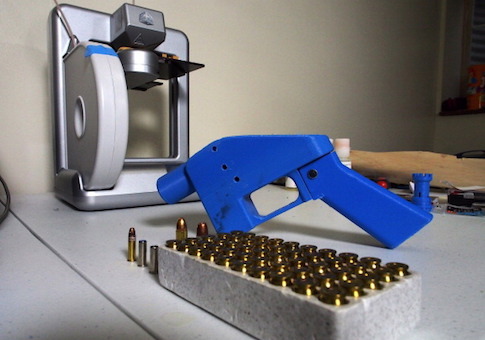 "Only because this case involves technical information on production of firearm components on a 3-D printer have these anti-rights officials acted to squelch it. We cannot allow this to happen." Cuomo, Wolf, Denn, and Shapiro did not immediately respond to a request for comment.